A few months ago Goose and I went to Smashburger for the first time and tried out their Sweet Potato Fries. They were among the best we’d ever tasted. Ever since I’ve been experimenting to try to create something similar at home. 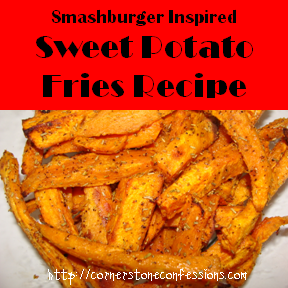 When doing a search online for Smashburger Sweet Potato Fries Recipes, we tried the few available but none left me going “this is it.” So, I ventured out to come up with my own recipe and everyone in the family agrees its the best yet. Try ’em and let me know what you think! Enjoy! Microwave the sweet potatoes for one minute to soften. Add olive oil to sweet potatoes and mix to coat. Mix remaining ingredients and add to sweet potatoes. Mix to coat. Spread sweet potatoes on a lightly greased cookie sheet or jelly roll pan. Bake at 350 degrees for 10 minutes. Turn the potatoes over. Bake 10 more minutes. Turn again. Well you will definitely have to let me know what you think. I make no claims to be the expert chef but like to share what has worked for me. Hope you like them! That looks so yummy. I love sweet potato fries. I will be featuring this tonight at my Sizzle into Summer party that opens at 8pm EST. Please stop by and pick up an I’ve Been Featured button. Thanks. Thank you for sharing at Thrifty Thursday, I can’t wait to try this recipe out! I have featured your post this week! I hope you will join us again!! At the end of recipe you say “boil” the potatoes, did you mean to say “broil”? Oh my, yes! Thanks for noticing. Ha! That could make a BIG difference. I’ll be sure to change that. Thanks again!